Penelope Prescott, 16, longs for adventure. She meets Kelvin Sutton, 17, a hip classmate with a strong Christian faith and they become fast friends. When they, along with a couple of cute boys, find an abandoned mansion in the woods, it seems like the perfect place to party. But they soon discover that someone else is using the property for sinister purposes when they uncover a chemical spill. Curiosity gets the best of them and before they know it, they find themselves involved in an underworld they know nothing about and their lives are no longer safe. 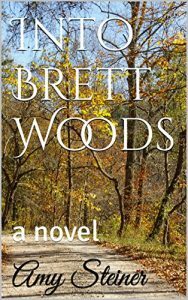 When I was 16, one of my friends discovered Brett Woods in Fairfield County. It became our place to party on the weekends. I have wonderful memories of singing around the bonfires we built in front of a giant boulder, and being with some of the best people I've ever known. I decided in 2016 it would be the perfect backdrop for a novel, and I started writing. Penelope is based on the part of me that is shy and unsure. Kelvin is a cross between a very good friend of mine from high school and the part of me that's gregarious and fun-loving. The two boys, Dan and Ted are based on one of my good friends and my brother. I know many colorful people and I often draw on them when writing my books. Penelope couldn’t see in the pitch blackness. Not even a glimmer of light pierced the darkness. She strained her eyes, but it was no use. A strange odor emanated from the floor beneath where she lay. The smell grew stronger with every second. Her clothes were wet underneath her, and she felt light headed. In desperation, she lifted her head to catch a breath. The atmosphere around her was slowly turning to poison. She could taste it. And the toxic smell burned her sinuses. Each time she inhaled it burned. She started choking. The cramped conditions prohibited much movement, and she wished she had something, anything to cover her nose, but her hands were unusable. They were bound behind her back with duct tape. In desperation, she tried to stand, but she hit her head hard on some hidden ceiling above her. Dizzy, she crouched back down to a squatting position and again held her head up, away from the liquid, and took another breath. She reached back, the tape digging into her wrists, and touched the wall behind her. She was surrounded by cold cement with a very wet, very foul fluid flowing about an inch deep underneath her. I’m going to suffocate in here! Her breathing became rapid, little, jerky breaths that left her throat raw from the poisoned gas and pain spreading through her chest. She started screaming, kicking frantically at the cement walls. No one heard. No one came. Her skin burned. She had to calm down, but calming down seemed impossible. So, this is how it feels to die. I’m only seventeen, and I’m going to die. With no time to lose, she used all her remaining strength to roll onto her right side and partway up a curved wall, anchoring her foot to the floor. Turning her face away from the fluid, she took another breath of cool air when she felt something sharp digging into her shoulder. She jerked reflexively and it fell to the floor. What was it? Hope rose in her heart. Maybe it was a shard sharp enough to cut duct tape. She had to find it. She took a deep breath and held it. Anxious, she rolled back down to the floor and shuffled toward where she thought it had fallen, moving forward on her belly. She heard another gushing sound and liquid began running underneath her again. She could no longer hold her breath, so she inhaled involuntarily. Luckily, the chemical smell had faded and was nearly gone. There was water running beneath her. Not a chemical. Beautiful, beautiful water. Relieved, she took some deep breaths of fresh air. The water receded slightly, and she could feel something scraping underneath her chest. She lifted her head again and inched along the wet, slimy floor until she felt it grazing her stomach. Hope filled her once more as she realized that it was a perhaps a sharp piece of cement that must’ve broken away from the wall. She rolled over onto her back and tried reaching for it with her hands it, but it slipped away from her again. Turning over again, she plunged her leg into the water with sheer determination. She banged her heel against the cement floor until her shoe slipped off. Using her toes, she searched desperately for the shard. She had to reach it. She felt it under her foot when another surge of water came gushing toward her, and it slipped away again. The chemical odor returned with a vengeance. Her head fell back against the wall. Looking into blackness, she took another deep breath and held it. The fumes from the water rose up and stung her eyes. Nearly exhausted, she plunged her foot back into the noxious chemically laced water. Her foot felt like she’d stuck it in a fire. Pain lanced up her leg, and she squeezed her eyes shut, unable to stop the tears. Quickly she combed the bottom with her toes, but feeling nothing; she pulled her foot out again and leaned her head back. Her foot stung fiercely, but she stuck it back in again, feeling around for the shard. She found it. This time she held on tight. Another gushing sound and a wall of water slammed into her as if someone had opened up a dam. It hit her hard, freezing cold, and it sent her hurtling backwards. Too weak to resist, she let the water carry her down what seemed to be a tube, feet first. The shard was lost once more. She held her head above the rising water with difficulty. There wasn’t much room still, but she noticed with relief that her breathing came easier. The chemical smell was dissipating, and she could inhale without coughing. But her strength ebbed as she tumbled along, and in any minute, she feared her head would slip under the mountain of water for the last time. She didn’t know how far the current carried her, but suddenly her body slammed against something so hard she nearly lost consciousness. The rushing water pinned her against it, compressing her chest and making each breath laborious. She was desperate to stay alive, but too weak to fight the furious water. She started to slip away. Everything went black.